The DAP-2695 AC1750 Plenum-Rated Dual Band Gigabit PoE Access Point delivers reliable, high-speed wireless performance using the latest 802.11ac standards with maximum wireless signal rates of up to 450 Mbps over the 2.4 GHz band, and 1300 Mbps over the 5 GHz band. Enclosed in a rugged, plenum-rated metal chassis, it adheres to strict fire codes for placement in air passageways. For advanced installations, this high-speed access point has integrated 802.3af PoE support. The DAP-2695 supports advanced radio management features such as band steering and airtime fairness. Band steering detects and steers 5 GHz capable clients away from the overcrowded 2.4 GHz network to the less congested 5 GHz network. Airtime fairness allocates time equally among clients, so each client can transmit at its highest speed regardless of location or 802.11 standard version. The DAP-2695 supports both Personal and Enterprise versions of WPA and WPA2 (802.11i). It also includes RADIUS, MAC address filtering, wireless LAN segmentation, SSID broadcast disable, rogue AP detection and wireless broadcast scheduling to protect the wireless network. The DAP-2695 also includes support for up to eight VLANs per band for implementing multiple SSIDs. Network administrators have multiple options for managing the DAP-2695 Access Point, including Web (HTTP), SSL, SSH, and Telnet. For advanced network management, administrators can use the D-Link Central Wi-Fi Manager controller software to configure and manage multiple access points from a single location. Scalable and flexible, Central Wi-Fi Manager is accessible anytime, anywhere, though the Internet by using a web browser. 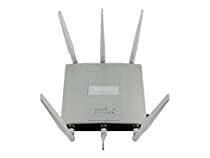 In addition to a streamlined management process, Central Wi-Fi Manager software provides enterprise-level features, including bandwidth optimization, captive portal, and RF optimization-Link offers a Limited Lifetime Warranty on the DAP-2695 to further its commitment to product quality and long-term customer confidence. I gave it 5 stars based on the fact it is stable connectivity. It is replacing a Ubiquiti 802.11n long range, as the 2.4GHz is saturated spectrum is saturated with neighbor's wifi and any service ( netfilx, sip calling via republic wireless) requiring a steady stream of data didn't work. "6. BTD2014110090-STA cannot associate with AP." "STA" means station, meaning your computer, phone, device..etc. I was able to connect out of the box, soon as I changed the SSID and password I could not connect with my laptop via wifi, I reset the box 3 times, every time i tried to connect after the changes, no go. After firmware upgrade, problem was resolved. Keep in mind this is a business class ( i wouldn't call it enterprise class ), so not consumer level, my point is, it is not the most intuitive to set up and the documentation is not the best at explaining what something does. But the documentation is good enough. The GUI is old, nothing fancy. But at least it has a gui running on the device as the ubiquiti unifi WAPs dont have any way to locally control or setup their device. Another thing I liked is the feel of this box, it was much heavier and seems much higher build quality than the Ubiquiti products . The one thing i didn't like vs the Ubiquiti is the guest network. Ubquiti the guest control logic is built into the WAP, meaning you restrict guests from connecting to any other local address (rfc1918 IPv4 address space). 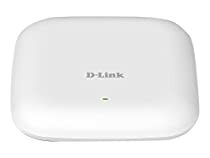 With the Dlink, you need to set up separate SSID to vLAN mapping, you switch also has to support 802.1Q vlan tagging to separate the traffic. My ubiquity edge router lite does all layer 3 functions, so i set up dot1q, DHCP, and ACLs to only allow only internet traffic for the guest network. The vlan to SSID mapping was a bit confusing ... but after trial and error, got it working. All in all, if your an advanced user or looking for a small business, think this would be a good product. If this is for your home and your tech savvy still a good fit. If you get frustrated with tech or network tech easily, don't get this, or have someone who is set it up for you. I purchased this AP for two separate business locations after trying several Netgear and Linksys entry level business APs that were full of firmware bugs that required daily resets to correct. So far both the D-Link A1750s have both been running trouble free for 2 weeks. One of the APs that I purchased is in a 5,000 sqft building and it provides ample coverage for the entire building. The AP body is all metal and feels very well made. I highly recommend this AP. Best AP I've ever used. A bit different to setup than other D-Link routers and Access points, but it kicks hard when it's said and done.